I have some fond memories of this place. Can Anyone remember the saturday matinee for kids around 1985-87. i went personally, loved it. Saw 'Back to the future' there for the first time. I remember seeing the poster out on the wall. I wondered what the hell was the thing with the light....figured out it was the door. That movie made my hair stand on edge due to the excitement of it. 5 times I went to see it there. Also saw the goonies too! Sorry, you mentioned the Goonies, the ultimate UE film. Did anybody go and see the Rocky Horror picture show there over the years? You used to ge a wee bag with rice, toast, party hats etc to throw about at key parts of the film..... great days!!! Bonz wrote: A quality wee cinema! i used to work there when i was a student, i think it was for 6 months in 1996. the staff there just used to muck about all day: deliberately breaking all the chocolate bars; eating the popcorn; and trying to shovel a scalding-hot hotdog into your mouth as soon as the managers back was turned (she was useless). as punishment, a bad worker was sent to watch the worst movie at that time - "screen supervision" - that way i got to see Star Trek First Contact, The Van, Michael, and Jingle All The Way about 6 times each. on the night we did a russ meyer double bill, i caught a guy amusing himself during Ultravixens. messy. do you remember that the staff were the rudest people in teh service industry? "you want a ticket or not?" being a classic, or "sit the f*** down" another. when i started, the other staff were made to apologise, just on the off chance that they may have offended me when i was "just a customer"
the projection room was cool - but i think it drove the projectionists a bit mad, being locked in a very dark room with clicking and buzzing noises for 10 hours a day. also, we got to go into the old balcony from time to time. you would enter up the old fire escape behind the cul de sac, and sit where the stalls used to be, watching the lights from the screens below flicker through holes in the floor. i loved it up there, it was really beautiful with all the ceiling mouldings. even though the buidling of the loft bar destroyed the rest of the cinema, the ceiling that is there now is a pretty good likeness to what went before - although the old one was red and gold. we were always promised a visit to the old salon, which at the time was still unused, but we never got to go. shame, that. where i work now, we have a 120-seat cinema set up by the same company that did the old grosvenor. theres even the same old projection equipment here. mrpattersonsir wrote: also, we got to go into the old balcony from time to time. you would enter up the old fire escape behind the cul de sac, and sit where the stalls used to be, watching the lights from the screens below flicker through holes in the floor. i loved it up there, it was really beautiful with all the ceiling mouldings. even though the buidling of the loft bar destroyed the rest of the cinema, the ceiling that is there now is a pretty good likeness to what went before - although the old one was red and gold. we were always promised a visit to the old salon, which at the time was still unused, but we never got to go. shame, that. Fascinating, thanks for those memories! Were there any old seats or anything in the balcony when you saw it? 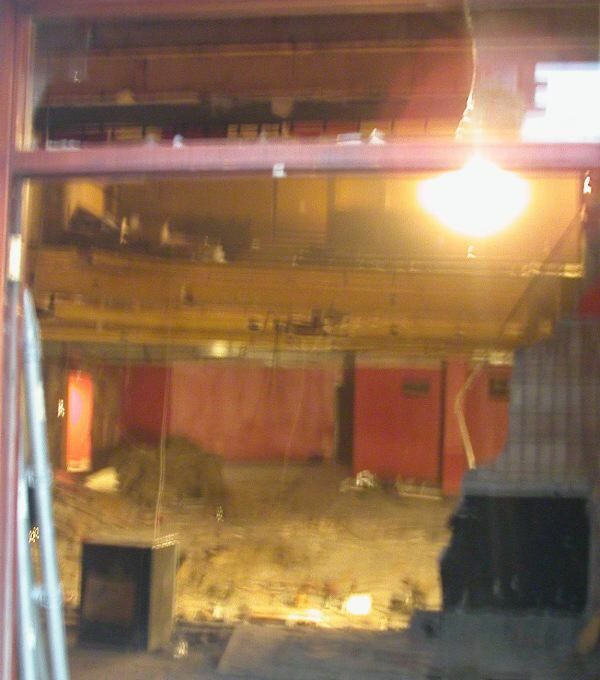 One of the photos I managed to get through a hole in the wall during demolition also shows what looks like wooden screens at the back of the balcony; can you remember anything about that or what they might have been? Where is it you're working now? Is that a Caledonian cinema? You'll be amused to know its the same old projection equipment they're still using at the Grosvenor despite its classy makeover! Yup, made it to one of these, circa late 80s. The screening was at midnight and we had all got tanked at the QM beforehand. So needless to say there was an extraordinary amount of nonsense afoot, culminating in the manager coming out in front of the screen,the sound going off, and him announcing that the water had been turned off on account of so much of it getting chucked around the cinema. Classic cinema moment. Got my first (and only!) cinema knockback there too when we tried to go and see The Fog when we were well beneath the age to see an "X Cert" film. nodrog wrote: Fascinating, thanks for those memories! old seats : not that i remember, just sort of bare floors. there were tattered posters on teh walls, not for anything fancy, just bingo / fire safety stuff from what i can remember. wooden screens: the wooden panels wouldnt be related to the old grosvenor screens, as they where directly behind the entrance. as with the original screen from way back. what you likely saw was a corridor running frombeside the front of the projection box, or possibly the staff room - not glamorous at all, sorry! there were some corridors/fire escapes down that part of teh building, in fact looking at the photo again, its just a stud wall. working now : i work in LT Scotland, its in teh old st ninians teacher training college / convent just behind byres road. its a completely mental old building, which unfortunately we will be vacating soon. the cinema comes from when this organisation made 16mm educational flicks, and is still occasionally used by scottish screen (who rent an air-conditioned basement from us - it runs the length of bowmont gdns, and is used to store their archive). ive been fiddling around in the cinema all afternoon, as i'm doing a seminar there tomorrow, and i've found parts of it i never knew existed. give it two years and it'll all be gone, turned into flats no doubt. mrpattersonsir wrote: on the night we did a russ meyer double bill, i caught a guy amusing himself during Ultravixens. messy. I went to see a Russ Meyer double bill there once. T'was Supervixens followed by Beneath the Valley of the Ultravixens. Fortunately i didn't witness anyone "amusing" themselves. By the way mrpattersonsir, do you "kitten"?? I also remember going to see Bigfoot and the Hendersons there. Strange. Just a swift question for Mrpatersonsir - did you work at the Grosvenor when a certain Bernadette was the manager?? She joined us at the Odeon just before the Grosvenor closed for refurbishment, so I'm curious for the Grosvenor staff viewpoint! I occassionally correspond with a girl called Katie who worked there, and my ex and her ex used to work there too, all in about the mid 90s. Ahhh, the Grosvener. A favourite haunt of mine when trying to woo certain young ladies. Think the last film I saw there was Batman 3? the one with Jim Carey and Sam Lee in it methinks? gap74 : yep, i know her well. however, when i signed up for this forum, there was a bit about slander and saying nasty things, and how it could get me chucked out. so i need to be careful here. i never liked the woman, and she did her best to make life difficult for herself and others. read into that what you will. also know katie too, she was really good crack, if you see her, tell her paddy says hello. whos your ex then? maybe know them too. Never saw RHPS there, but went to the late night showings of the Indiana Jones trilogy (twice) and the Back to the Future trilogy. The Grosvenor had its wee merits like showing films like that, but the seats were terrible, and it wasn't airconditioned, which shouldnt be a problem, but I half passed out once in there, bizarelly enough at a late showing. I remember seeing the Green Mile in there during my first year at uni, those seats for 4 hours, not good.